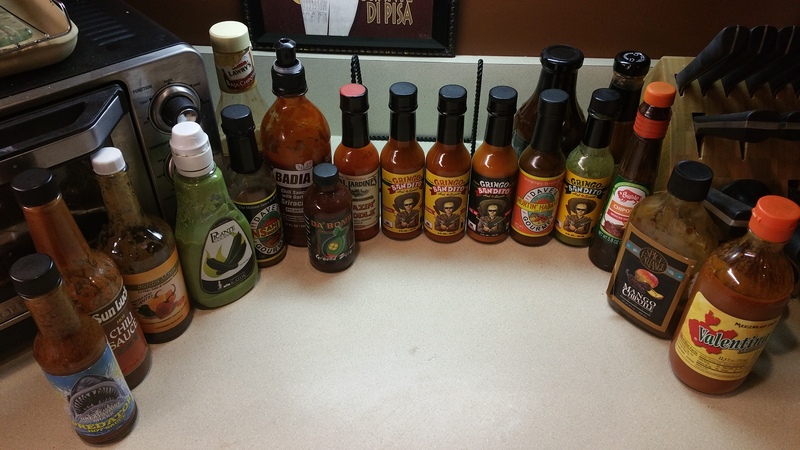 What are you currently into and how many sauces are in your “line up?” I will take a pic soon. I think I might have to thin down my selection…or maybe not I seem to accumulate them and then even after consuming them at home and “donating” them to the community fridges at work, I still seem to have too many. I hope we can get some new ideas from this thread. I keep three. Tabasco - because that’s what has always gone in those recipes. Sriracha - because everyone has sriracha, don’t they? And Mitchell’s chilli & garlic sauce which, in spite of its Anglo name, I only see in south asian shops - it’s pretty much my standard dipping sauce for koftas and the like. Good tip, I will add this to my list to try. John, I’m also a big Tabasco fan…quite a classic. I like the green jalapeño Tabasco too. That makes a delicious dip with sour cream and a boat load of cilantro. The recipe is actually with the bottle when you buy it here in the US. I just picked up 4 different bottles of gringo bandito, seen in the center. I’ve only tried their regular green (habanero based ) yesterday and I was really impressed. HaHa, no such thing. They may sit around for awhile but then you always find a use for them. Bloody Mary’s anyone! I’m pretty traditional when it comes to hot sauce. Tabasco mostly, and Frank’s Red Hot for wings. At the office I’ve tried the Chipotle Tabasco which is pretty good. I like the green stuff they put on burritos at Chipotle , but not sure what brand it is. I’m not a huge hot sauce guy…but I do enjoy sriracha a lot, even keep a bottle at work. I have the obligatory tobasco, a few hot mustard’s and for wings I prefer sweet baby ray’s buffollo wing sauce. That’s really about it. I do enjoy cooking with cayenne peeper though and include a pinch (or more) as well as traditional hot pepper seeds. Crystal Hot Sauce and Tapatio are what I keep In the house, occasionally Valentina and Louisiana Hot Sauce. I’ve always disliked Tabasco, and I don’t like Sriracha very much either. I’m an outlier. We aren’t much of a hot sauce household but I do keep 3 different kinds in the fridge: Sriracha (for guests), Ashanti Louisiana Hot sauce (for me) & every other year I make a pilgrimage to Hatch, NM for those fabulous green chilis to make my own green chili sauce. I’m not a Sriracha fan either. DH recently got into hot sauces and loves Cholula Chipotle. He makes the “Frankie” margarita. This all started when he started dieting and found out that hot peppers help with weigh loss. The “Frankie” consists of tequila (prefers Casamigos), lime juice and some Frank’s or sometimes Cholula, and sometimes a tiny, tiny hint of ghost pepper sauce., and a bit of smoked sea salt. For sure, the Chipotle goes in the morning eggs along with smoked sea salt. Like Redheadcook, not a hot sauce household too. Found several at home, the classic tabasco, Heinz jalapeño hot sauce, the Japanese Yamajirushi Yuzu-It hot pepper sauce (mostly for salad), Le Phare du Cap Bon harissa and recently I got myself a small bottle of Sriracha, mainly for Vietnamese cooking, usually not a big fan of Sriracha, too sweet, but it works well with certain recipes. I didnt know they did a sauce, as well as the paste (which I’ve always got). Must look out for it next time I’m in the Middle Eastern grocer’s. Most of the time, you are right about paste is used for a preparation. Though, I remember seeing people using the tube harissa on a finished dish (especially for someone who want hotter food). Personally I must say sauce is more appealing than paste on a finished dish. How can I forget the Chinese XO sauce! Right now I don’t have any at home, but I need to get a new bottle, so good! It’s one of the sauce, I can eat alone without other food, just delicious. Another thing, I have this stored bought bottle of olive oil with a whole chili, grains of red and while peppers, a branch of thyme, a piece of bay leaf and a whole cinnamon. The longer we keep it, the hotter it becomes. I don’t think it is a sauce, but more a condiment, and we mainly use it for Italian food, pizza or pasta. I keep a good many in the fridge. The Marie Sharp line is formidable. The green habanero sauce is strong but not crazy. The red “Belize” habanero sauce is crazy hot–almost as hot as “ghost pepper” sauce. I use both, depending on what’s on the plate. The green Tobasco sauce is also under-rated (more vinegar than heat) and works well with guacamole. The Bonesucker habenero sauce has flavor and deep heat. Valentina as others have mentioned is pretty mild, from Mexico. Crystal is my favorite N.O. hot sauce (and more flavorful than Tobasco but used for different purposes.) Matouk’s got scotch bonnets in it, which gives a fruity heat. We are a hot sauce household. I know we have a couple others, but I can’t remember exactly which ones right now.